A beautiful pull-over dress with a full pointed collar in the front and back and long sleeves gathered at the wrists for a feminine look. Available in adult, children’s, and plus sizes. Cut dress as needed to adjust length; no hemming required (fabric does not fray). 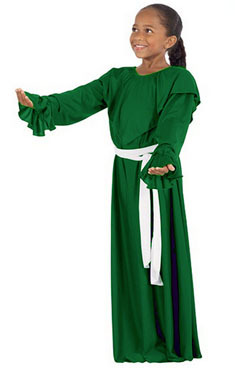 An essential dress to any Praise / Liturgical / Worship / Lyrical / Mime / Spiritual Dance wardrobe.Shown with Eurotard polyester sash, (EU 13733), sold separately.